The Texas Progressive Alliance hopes everyone stays safe in the snow as it brings you this week’s roundup. Off the Kuff interviewed Harris County Sheriff candidates Ed Gonzalez and Jeff Stauber. SocraticGadfly questions the mainstream media narrative that the GOP presidential race is down to a Trump-Cruz two person event with this analysis and has a follow-up skewering of the Trump-Palin fun coming. State Sen. Rodney Ellis, state Rep. Garnet Coleman, three current and one former Houston city councilmen all want to take the place of the recently-departed Harris County Commissioner El Franco Lee on the November ballot. PDiddie at Brains and Eggs has the latest on the most highly contested 2016 race that you won’t be eligible to vote for. Of course the frackers are big GOP donors. CouldBeTrue of South Texas Chisme knows that the Texas Republicans don’t work for you. They work for their rich buddies. 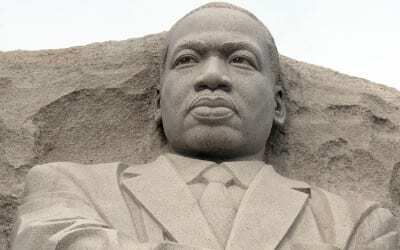 Neil at All People Have Value took a Martin Luther King Day picture of two different types of birds sharing space in peace. We could learn from these birds. APHV is part of NeilAquino.com. Keep Austin Wonky interviews Texas House candidate Huey Rey Fischer. The Current advertises a movie screening to raise money for the Texas Civil Rights Project. Texans for Public Justice filed a complaint with the FEC against Ted Cruz for his failure to report those Goldman Sachs and Citibank loans from 2012. Anastasia Hansen tells you things you may not have known about Houston’s bus system. Progress Texas documents four decades of Texas abortion laws. These Boots were made for Walkin?? Only if you’re tall enough to touch the Texas skies. For 36 years, ‘The Giant Justins’, a sculpture by Bob “Daddy-O” Wade have greeted shoppers, tourists and fans at San Antonio’s North Star Mall. 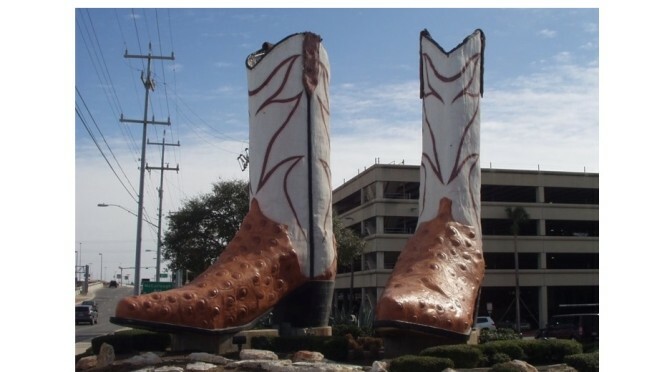 The 40 foot tall twins have been certified as the tallest pair of boots in the world by the Guinness Book of Records. So there you go folks. 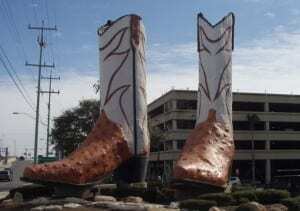 Everything may not be bigger in Texas, but at least when it comes to boots, we’re walkin’ all over the competition. By this point in the Obama Presidency, one thing is clear… the legacy of our nation’s 44th President is not being debated in the halls Congress, but in the halls of our nation’s highest courts. Such was the case with the President’s landmark legislative achievement– the 2010 Affordable Care Act, and again the case in last year’s historic ruling which brought Marriage Equality of to all 50 states. In the summer of 2014, efforts to pass new laws to overhaul the country’s immigration system seemed to be on a slow road to nowhere. In remarks at the White House on June 30 , President Barack Obama announced that then-House Speaker John Boehner had told him that Republicans would “block a vote on immigration reform at least for the remainder of this year.” Arguing that “Americans can’t wait forever” for Republicans to act on immigration, Obama indicated that he planned to go it alone. And he did. In November of that year, Obama announced a new policy that would allow undocumented immigrants who can meet two criteria – they have children who are U.S. citizens or lawful permanent residents (also known as “Green Card holders”) and they have been in the United States at least since January 2010 – to apply for a program that would allow them to stay in the country for three years and work here legally. The policy, which could allow as many as four million undocumented immigrants to remain in the country, never went into effect. 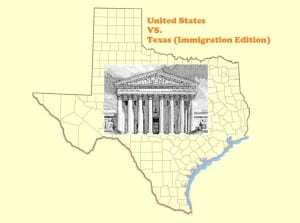 Instead, Texas and twenty-five other states went to federal court to try to block it. So far, they have been successful: a federal trial judge issued an order to keep the policy from going into effect, and a federal appeals court upheld that ruling. The Obama administration asked the Supreme Court to weigh in, and today the Justices agreed to do so. This means that the Court will almost certainly hear oral arguments in the case in late April, with a decision expected in late June – just as the 2016 presidential campaign, in which immigration has already played a major role, really starts to heat up. Given how bonkers the race for the White House has been so far, “heat up” doesn’t even begin to describe what could occur with this new drama thrown into the mix. But even accepting the drama, the court’s decision to hear this case is beyond critical. Congress has simply refused to take any action towards Comprehensive Immigration Reform, even as American families continue to be torn apart by the deportation of their loved ones. Instead of doing what is best for the nation, Republicans in particular (though plenty of Democrats share the shame of this issue as well) have chosen to take the “easy way out”– blame President Obama for everything wrong with the system, and avoid the issue as long as possible. One other essential point, the case states are waging against Obama’s Immigration Action Plan is in itself something of a long, overly politicized farce. 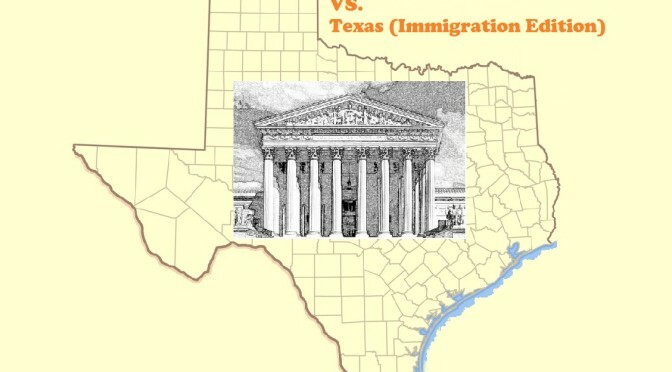 For starters, Texas has been begging the Supreme Court to not weigh in on the matter. Eventhough they (we?? UGH) are lead plaintiffs in the case, they would rather keep the issue in legal limbo than actually get any answers that would help real Texas families figure out what to do. Secondly, the states’ argument is is inherently unequal. They are essentially petitioning for the Executive Branch to do its job less well. The whole reason that an Immigration Action Plan is needed is because the United States cannot deport all of the undocumented persons within its borders at any given time. This creates the absolute necessity for prioritization. The states themselves would never do this. If Greg Abbott announced today that he was going to fill every pothole that existed in the state of Texas within 24 hours, people would laugh off his words because the task is simply not possible. Yet in their petition, they are asking the Federal government to sustain a system that is just as senseless. By rejecting these prioritization policies by the Obama Administration these states are asking for the courts to let our communities be less safe, to continue to orphan more American citizens by tearing their families apart, and to not seek and remove dangerous criminals from our streets. Third, a central point of the state case again boils down to resources. Admittedly, this is a valid argument in many respects, as it is state and local government that ultimately must implement this Federal policy, and would bear the cost of processing the deferred action requests. But the question to ask here is whether or not this presents an “undue burden to the state. For all of the time that it takes to enact a DACA or DAPA request, how much time and money is being saved by not having to enact the expensive and often tragic processes of deportation? If our communities are ultimately safer and better by bringing people out in the open, do those temporary inconveniences bear better results in the end? While these questions are still up for debate, many legal scholars consider the Obama Administration’s case for the plan to be very strong. For all of the above reasons and more, let’s hope that the Supreme Court’s decision to take up the case will lead to a common-sense result. On this 2016 commemoration day for the Reverend Marting Luther King Jr., an assessment of his Dream can be most clearly found in a voice from the past. Though his writings pre-date King and the American Civil Rights movement by a generation, their message still rings clear into the 21st Century. Much progress has been made, but Americans are now living in a time where the rights that we treasure are slowly slipping away. The only way to stop this is to get involved and work for the rights of all.